Amid a tumultuous business environment, the silicon foundry industry is projected to see steady growth in a number of process segments in 2017. As in past years, the foundry market is expected to grow faster than the overall IC industry in 2017. But at the same time, the IC industry—the foundry customer base—continues to witness a frenetic wave of merger and acquisition activity. Basically, the consolidation translates into a dwindling customer base for foundry vendors. Adding to the uncertainty is a mixed picture for the overall IC market in 2017, plus some possible instability in the current economic and political climate. In total, the worldwide foundry market is expected to grow by 6% in 2016 over 2015, according to Jim Feldhan, president of Semico Research. “2017 will see foundry growth improve to 10%,” Feldhan said. • There is constant pressure from customers worried about cost, cycle times and inventory control. But foundry vendors also continue to innovate. They are expected to ramp up a range of new processes in 2017. At the high end, for example, Intel, Samsung and TSMC will ramp up 10nm finFETs in 2017. In addition, TSMC plans to roll out a new 12nm finFET derivative, with 7nm in the works. In addition, the high-end planar process market remains robust. And other foundry markets, such as BCD, CMOS image sensor, embedded memory, mixed-signal, power semiconductors and RF, are strong. To help the industry gain an insight into what’s ahead in 2017, Semiconductor Engineering examined foundry markets at the leading-edge nodes, planar processes and the specialty front. The IC market is a mixed bag. In one forecast, for example, Semico projects that the overall semiconductor market will decline by 2.5% in 2016, compared to 2015. IC units, however, are expected to grow by 4.2% in 2016, according to Semico. Feldhan points to several macro trends that impacted the declining IC market in 2016. First, world economic growth was lower in 2016 than 2015; second, markets that previously sustained semiconductor growth are down or flattening, Feldhan said. The PC market continues to decline, while the smartphone market is saturated and slowing to single-digit growth rates, he said. On top of that, prices for chips related to PCs and smartphones experienced a significant degradation in 2016. And finally, the memory market, particularly DRAMs, experienced overcapacity and declining prices in the first half of 2016, he said. But there is some good news here, as well. In 2017, Semico projects the semiconductor market will return to positive growth, increasing by 5.3% over 2016, with IC unit demand is projected to grow by 5.2% in 2017. Semico’s Feldhan sees several macro trends in 2017. “World economic growth is expected to be slightly better. In addition, the smartphone market is expected to be slightly stronger, resulting in more stable pricing. And the memory market will achieve equilibrium, resulting in stable prices with increases in consumption for both DRAM and NAND,” he said. All told, the industry remains cautiously optimistic heading into 2017. “Customers are continuing to proceed with business as usual, although there is some guarded cautiousness out there,” UMC’s Ng said. It’s not all doom and gloom, though. For example, automotive, digital TV, IoT and medical electronics represent strong growth markets in 2017 and beyond, according to IC Insights. Fig. 1. Where the growth is expected. Source: IC Insights. The market for solid-state storage (SSD) drives is also strong, thereby fueling the growth of NAND. “Demand for server SSD will remain strong due to an increasing portion of high-density datacenter products and expanding adoption of all flash array in the enterprise,” said Chun Sewon, senior vice president of memory at Samsung. What else is hot? “Looking further ahead, we are excited about emerging trends in virtual and augmented reality, big data, artificial intelligence and smart vehicles,” said Arthur Sherman, vice president of marketing and business development at Applied Materials. Meanwhile, in the foundry business, Intel, Samsung and TSMC are expected to make the transition from 16nm/14nm finFETs to 10nm finFETs in 2017. Both Intel and Samsung believe that 10nm will be a robust node. In contrast, TSMC says 10nm will be a short node and is putting more emphasis on 7nm in 2017. GlobalFoundries is skipping 10nm and moving directly to 7nm. While that shows just how competitive leading-edge foundry market will be, it also points to some confusion. For one thing, the definition and specs of 10nm and 7nm are becoming murky. In addition, foundry vendors are chasing after a finite number of customers at those nodes at a time when design and process costs for these technologies remain too expensive for most companies. TSMC is expected to move into 7nm risk production in early 2017. “Our 7nm has been adopted not only by high-end mobile customers, but also by high-performance computing customers for GPU, gaming, PC and tablet, virtual reality, server, FPGA, automotive and networking applications,” said Mark Liu, president and co-CEO of TSMC, in a recent conference call. In fact, TSMC plans to beat its rivals to the punch at 7nm. To do so, it will utilize existing 193nm immersion and multiple patterning for 7nm, which is considered a complex scheme. The foundry would rather use extreme ultraviolet (EUV) lithography, which would simplify the patterning flow. But EUV won’t be ready in time for TSMC’s 7nm schedule, so it plans to insert EUV at 5nm. At 7nm, Samsung and others are banking on EUV. EUV is making progress, but it still isn’t ready for production. There are still issues with the power source, resists and masks. Don’t expect a broad adoption for EUV at 7nm, however. “The real density benefit will happen at 5nm with a more pervasive deployment of EUV throughout the process flow and an earlier commitment to that deployment,” Fried said. Meanwhile, the 16nm/14nm finFET market remains vibrant. GlobalFoundries, Intel, Samsung and TSMC will continue to develop these processes. And in 2017, UMC is expected to enter the 14nm finFET fray. Not all foundry customers are moving to finFETs, however. Some will stay or move to the 28nm and 22nm planar nodes. GlobalFoundries, Samsung, SMIC, TSMC and UMC offer 28nm bulk processes. In addition, Samsung is also offering a 28nm fully-depleted silicon-on-insulator (FD-SOI) technology. And in 2017, GlobalFoundries is expected to ramp up 22nm FD-SOI. Embedded memory and RF, meanwhile, also represent growth markets for foundries. Today, the embedded market is dominated by traditional flash memory, based on NAND and NOR. Embedded flash is used in microcontrollers and other devices. The mainstream market for embedded flash is 40nm and above, although some are migrating towards 28nm. On top of that, several foundries are working with various customers on the next-generation memory types, such as FRAM, MRAM, ReRAM and even carbon nanotube RAMs. Foundries want to offer next-generation memory IP to customers. For example, GlobalFoundries is developing embedded MRAM for its 22nm FD-SOI process. Another vendor, SMIC, is developing embedded ReRAM based on the technology from memory startup Crossbar. Still, the next-generation memory types are still waiting to take off after years of R&D. But when they finally fly, will these newfangled technologies replace existing embedded flash or traditional memory like DRAM and NAND? Besides new memory IP, foundry customers also want integrated processes. In response, foundry vendors are integrating their processes with both nonvolatile memory and RF CMOS capabilities. The fragmented specialty process foundry market is also strong, especially bipolar/CMOS/DMOS (BCD), mixed-signal and high-end RF. One technology, BCD, is heating up. Based on 0.18- and 0.13-micron technologies, BCD processes are used for power management ICs in smartphones and other products. More recently, BCD is moving into the automotive space. Indeed, the IC content continues to increase in cars. Infotainment and navigation are growth markets for ICs. Plus, several safety features, such as automatic emergency braking, lane departure/blind spot detection systems and backup cameras, are among the new market drivers. Autonomous driving technology also is hot. In total, the automotive IC market is projected to reach $22.9 billion in 2016, up about 12% over 2015, according to IC Insights. Automotive still remains a small part of the total IC market. Its share of the IC market was only 7.9% in 2016, according to the firm. Meanwhile, the high-end RF foundry market is also robust. In one big application, mobile carriers are moving towards a next-generation 4G technology called LTE Advanced Pro. The protocol requires smartphone vendors to support more frequency bands in their systems, meaning the RF content is increasing in the phone. For that reason, demand remains robust for RF, especially the RF version of SOI technology or RF SOI. Used for switches and antennas in smartphones, RF SOI is produced by both IDMs and foundries. In addition, several foundries, such as TSMC, UMC, Win Semiconductor and others, are chasing after the gallium nitride (GaN) foundry business, including both RF and power semis. In total, RF GaN was a $300 million business in 2015, according to Strategy Analytics. 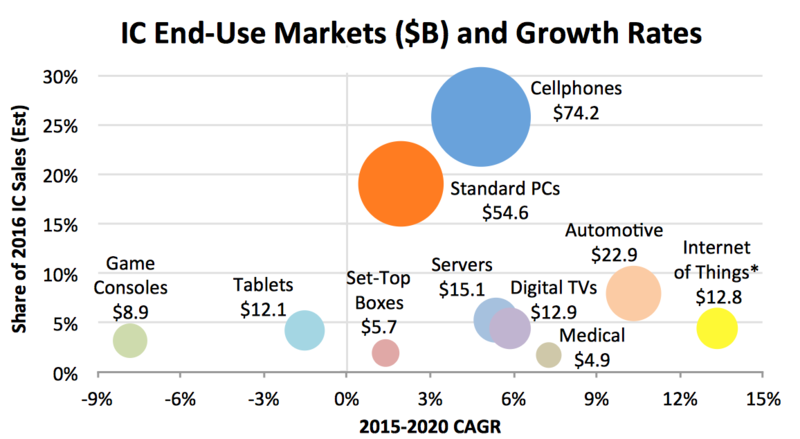 By 2020, the RF GaN market is expected to reach $688.5 million, according to Strategy Analytics. At one time, base stations mainly used RF power transistors based on laterally diffused metal oxide semiconductor (LDMOS) technology. But today, LDMOS is gradually being displaced by RF GaN. Foundries also are developing GaN for use in power semiconductor applications. Other foundries are pursuing another wide band-gap technology called silicon carbide (SiC). Both GaN and SiC represent new growth opportunities in the maturing semiconductor industry. For example, the GaN-based power semiconductor market is projected to be a mere $10 million business in 2016, according to Yole, but that business is projected to grow at an annual rate of 86% from 2016 to 2021. Will there be any fundamental differences between TSMC 7nm and Samsung 10nm?